Last month I explained that share price charts hide a wealth of information about the mood and sentiment of the market, with clues about likely future share price movement - in the chart patterns in particular. And this month I continue that theme and explain how even more information is available in the candlesticks - both the features of individual candles, and also in the patterns of multiple candles (like the Hanging Man pattern shown at right). long or short candle features. Money and Risk Management, including position size (ie. how to minimise losses and maximise profits). When we look at the price charts of any stock or index, we could look at a simple line chart, or a bar chart, or a candlestick chart. On a Daily line chart, the chart simply joins together the close prices at the end of each day. There is no indication of the range in price during the day. Many people are happy to look only at line charts; but they are missing out on all the extra useful details that are available in the candles. It can be so very useful to see how much the price had varied during the period. For instance, in the simple diagram above right, candle A has an average sized candle body, and only one tail which is a rather long lower tail. This suggests that sellers dominated the action during the day, but had lost interest (or had finished their selling) by the end of the day. This can be seen as a "rejection of lower prices". If this candle appears in a down trend, it is a suggestion that the down trend could be weakening. In an up trend it can forewarn of a possible reversal in the trend. In the same diagram, candle B is a more normal candle with a reasonably sized body and average length tails. 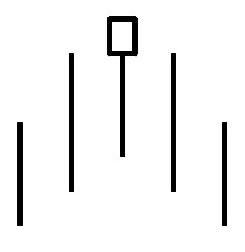 But candle C is a very tall candle with no tails - known as a Marubozu (Japanese for "shaven"). The white version of this candle is very bullish, indicating a lack of sellers in the period, and the black version is very bearish indicating a lack of buyers in the period. 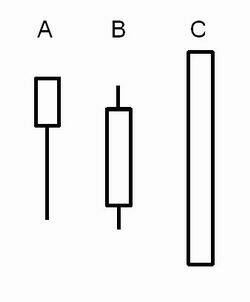 In the sections below there are some comments about how to identify candlestick shapes and patterns, including the psychology at play. Basic introduction to Candles (public information). Candlestick basics - the ins and outs of the candle body, the tails, and special features (public information). Candles introduction (for Members) - provides an overview of the key features to look for, and the key patterns in UP trends, and key patterns in DOWN trends. Candle-spotting How-To - The easy steps to spotting and identifying candle patterns. Candlestick features - Details about short and long bodies, and short and long tails, as well as the psychology of the market that causes these characteristic features. Single candles - the specific variations in single candles, and what to look for. Candle patterns in UP trends - The patterns that are relevant to up trends. Candle patterns in DOWN trends - The patterns that are relevant to down trends. How to spot the candle patterns? One of the things that puzzled me for a long time when I started studying candle patterns, was that there appears to be a long list of different patterns, and it is so hard to work out which pattern is which, and what they all mean. [Can you relate to that?] There is a lot of web-based material available that describes many candle patterns, but nothing to help explain how to easily identify the various candle patterns - until now! If you are looking at a candle chart, and wondering if there is a meaningful candle pattern on the chart, then keep reading. There are a couple of good steps to help you quickly work out if you have spotted a relevant candle pattern. I have described these steps under the Candle-Spotting heading here. 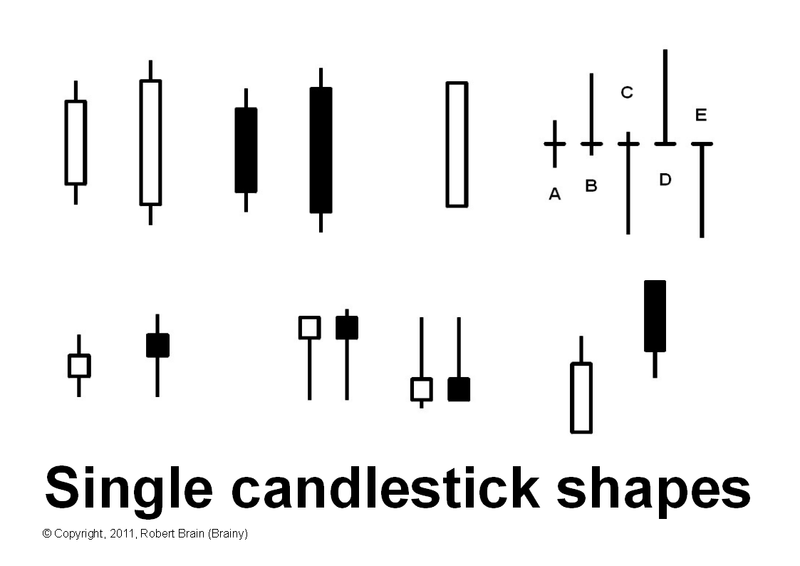 And further down that web page are some lists and diagrams of patterns to assist, including a simple chart of single candle shapes. Click on the image below for a larger version (and Toolbox Members can click here to view a printable PDF version with pattern names included). To help understand the importance of key features like short or long candle bodies, and short or long tails, I have a description of Candle Features here. This explains the psychology at play, and helps it all make sense. The next step to identify a possible pattern on your chart is to identify whether a clear up trend or down trend, is in place. If there is a trend, then the next step eliminates many possible patterns and shortens your target list. I have two charts that summarise the key patterns in UP trends, and patterns in DOWN trends, and the chart patterns are grouped into similar groupings to make it easier. Good descriptions for these are included (for Toolbox Members) on the UP trends page, and the DOWN trends page. TA-3700 "Candlestick patterns" (the free page 1 for Toolbox non-members is here). There are now a total of 102 Articles in this eBook collection of Articles (423 pages of information)! You can see the Master List of all Articles here, or the Detailed Topic Index here. And don't forget to see the revised Table of Contents pages (see links in side-bar at right).